Summary: Lots of changing weather and Halloween Festivities this week. Rain ending, small break on Thursday and Friday, followed by a rainy weekend. Trick or treating still in the air. Lots of things going on this week and everyone’s wondering when the rain will end and if it will return to wash out their festivities. As I sit here and snack on a piece of Halloween candy, let’s outline what you can expect this week. This post was originally written and published Tuesday, October 27th. Any updates will be noted. For Wednesday, expect a high of 67 degrees as rain finally moves out in the early morning hours. Winds will be gusty at 10-15 mph, with gusts up to 20 mph. The current HRRR (at the time of this writing at 8pm Tuesday), shows rain persistent through 8am tomorrow, then tapering off quickly. Some very light and isolated showers may try to develop after dark on Wednesday, but this should be minimal. Wednesday night will be mostly cloudy with an overnight low of 50 degrees. Winds will calm down to about 5mph coming out of the southwest. Expect things to dry out Thursday under mostly sunny skies with a high temperature of 64 degrees. Winds will be 5 to 10 mph out of the west. Thursday night the temperature will drop to about 40 degrees with calm winds under mostly clear skies. Things will continue to be dry as high school football and Halloween activities start ramping up. Friday’s high will climb to about 61 degrees with an overnight low of 46 degrees. Friday during the day will be sunny with clouds moving in during the night. 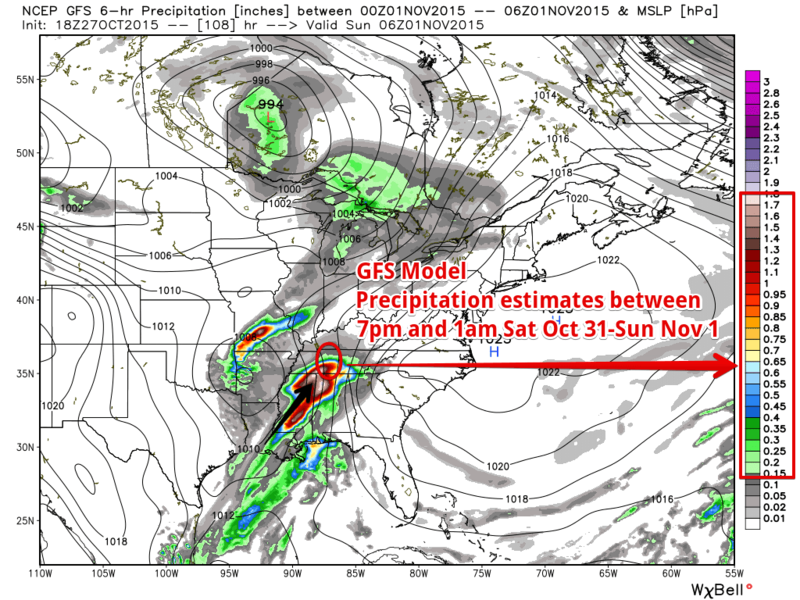 Another rain system moves in on Saturday, possibly putting damp plans on Halloween. Right now the NWS has a 50% chance of rain after 8am for Saturday, with a high temperature of 62 degrees. Winds will be out of the southwest at 5 to 10 mph. Saturday night also has showers mainly after 8pm with an overnight low temperature of 54 degrees. Chance of precip is 60%. Now, things change constantly in forecasting, and the models have been giving us different information the last several days. The medium-range models aren’t quite in range for Trick or Treating Saturday night yet, so we have long-range models to look at for now (which aren’t updated as often). When trick or treating starts Saturday night (5pm), the temperature is forecasted to be around 58 degrees with winds at 10 mph. Also currently at 5pm the forecasted chance of precipitation is 45%. The temperature will only drop a couple of degrees between 5pm and 10pm Saturday night. Rain chances do increase to 55% at 7pm and remain that way through the rest of Halloween night until midnight. As of this writing (Tuesday 8pm), here’s what the models are showing us. We’ll start with the GFS model. 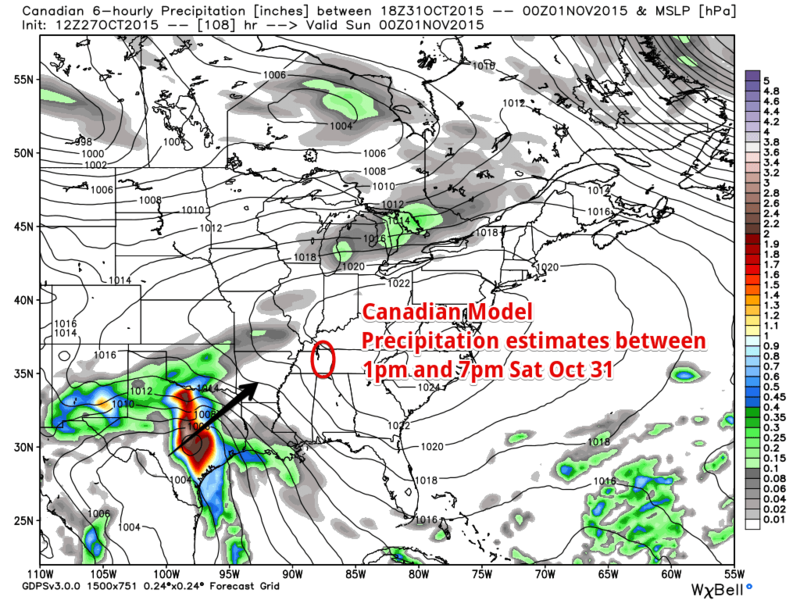 The models below show precipitation forecasts for 6 hour blocks of time. Trick or treating (and other Halloween activities) fall between two of these 6 hour blocks of time. The first is the 1pm to 7pm time frame (first image below). The next is the 7pm to 1am time frame (second image below). These are the Oct 27 1pm runs of the model. Rain moving up from the south southeast (black arrows) will be making its way into Middle Tennessee Saturday night. GFS estimates between 0.01 and 0.02 inches of rain between 1pm and 7pm on Halloween (not much at all). 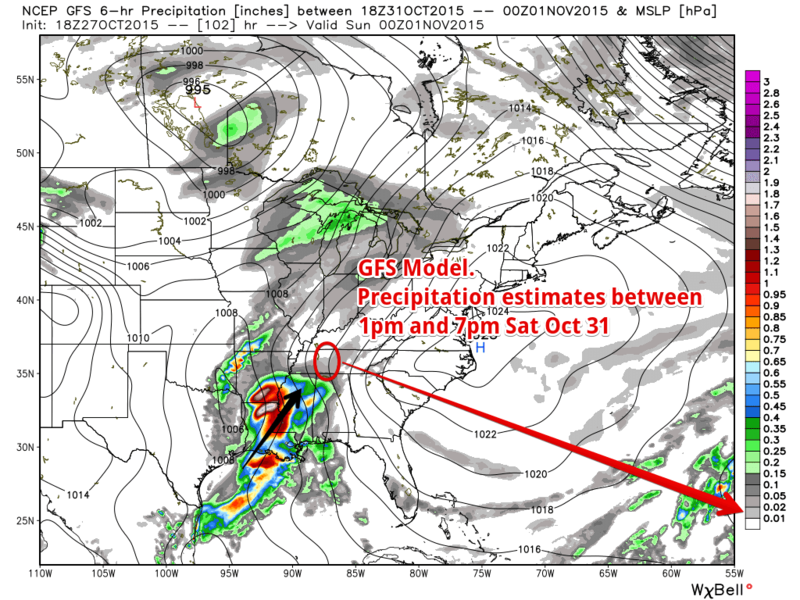 After 7pm is when GFS estimates rain to be between 0.15 and 1.7 inches between 7pm and 1am Halloween night. Does this mean that at 7pm, the bottom is going to fall out? No. This is an estimate of rain between those two chunks of time. NWS believes the bulk of it will arrive after 8pm Halloween night. The European model (of which no one can post images from due to restrictions) shows the rain getting here sooner than the GFS model above. 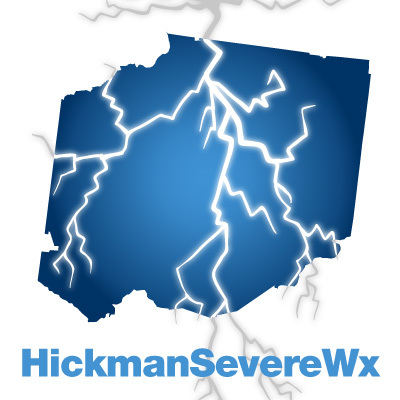 It actually shows between 1pm and 7pm most of Hickman County receiving between 0.3 and 0.5 inches of rain, which is washout territory. It also shows between 7pm and 1am us getting a trace of rain. Now on to the Canadian model. This is the less trustworthy model of the three long range models. This model doesn’t show any rain around us at all for Halloween night, showing the rain system still off to our southwest and not quite as here as the GFS model predicts. While I want this to be the case, I’m skeptical. The GFS and European long-range models are the most dependable ones we look at, where the Canadian model we only really look at to see if it is close to the others. In this case, all three models show something a little different, but I believe we will see a mix between the GFS and European models. Once Halloween starts getting more into the medium range models (NAM4 and NAM12) I will be posting those. Also, once the HRRR gets into range on Halloween day, that will give us a bit more clearer picture of what to expect. For now, prep for rain, but don’t rush to cancel plans. You may just have to move them up a bit if you plan to be outside, or go to plan B and find indoor activities for Halloween night. We’ll keep you updated as the day gets closer so you can plan accurately! 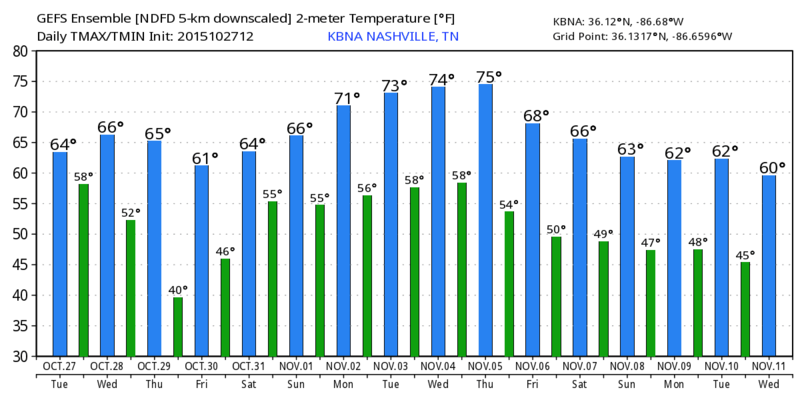 What will the temperatures hold for us past Halloween? Here’s a glance.